Blasphemy has been defined as the act of insulting or showing contempt or lack of reverence for a religious god/goddess or showing irreverence towards religious or holy persons or religious items such as relics (see post: The Relics of Religion). In some areas of the world, blasphemy can be punishable by death and other countries have, on their statutes, laws which allow those who feel that they have been offended by blasphemous words or acts to press legal charges. In English, the word ‘blasphemy’ has roots in ancient Greek where the word carried the meaning of ‘reputation’ or ‘injury’ or ‘speaking evil of’. In today’s world, the term ‘blasphemy’ is usually used in reference to religious ideas and, in effect, is an act ‘saying no to the gods’. One of the most well-known accusations of blasphemy was that against Jesus by the priests of the Jewish court, the Sanhedrin, perhaps more for political purposes at the time, than for religious reasons. Mark 14:55-59 states that the chief priests had sought witness against Jesus to put him to death but did not find any, so they arranged false witness against him. In Mark 14:61, the high priest asked Jesus: ‘Art thou the Christ, the Son of the Blessed? And Jesus said, I am’. A blasphemous declaration at the time. “Then the high priest rent his clothes, saying, He hath spoken blasphemy; what further need have we of witnesses?’ (Matthew 26:65). But well before, the trial of Jesus, another trial for blasphemy had taken place, under a different time, a different empire and with different gods. In effect, Socrates’ accusers cited two impious acts – failing to acknowledge the gods that the city acknowledged and introducing new deities’. 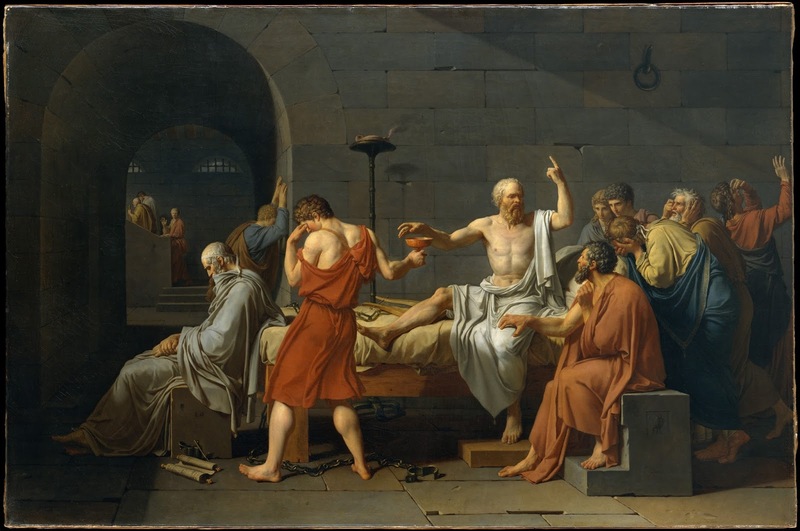 In both cases, that of the trial of Jesus and the trial of Socrates, those who held influence and power felt threatened (the priests of the Sanhedrin in the case of Jesus, the elite of the city-state of Athens, in the case of Socrates) by men who had significant followings. The political answer to this problem, of course, was to get rid of the two trouble-makers. Other than claiming that you are special, the ‘Son of God‘ (see post: The Sons of God) or a prophet, a person can be accused of blasphemy if he/she uses language unacceptable or creates depictions that are ‘disallowed’ by the law or are unacceptable to those in power. God gosh, golly (one of the Ten Commandments of the Hebrew and Christian Bible states: ‘Thou shalt not take the name of the LORD thy God in vain; for the LORD will not hold him guiltless that taketh his name in vain’). Other examples include ‘gadzooks‘, an altered pronunciation of God’s hooks, the nails with which Jesus was nailed to the cross and ‘criminy‘, an alteration of Christ’s money, the thirty pieces of silver paid to Judas for him to betray his friend. Pagan gods are, even today, still referred to in minced oath in expressions such as ‘by Jove‘ and ‘jumping Jupiter‘. The phrase ‘egads‘ is, effectively, an appeal to non-Abrahamic deities and violates the strict interpretation of the First Commandment (‘Thou shalt have no other gods before me’) in Judeo-Christian tradition. Despite the fact that Jesus was convicted of the charge of blasphemy, Christian theology condemns blasphemy – at least blasphemy which mocks Christian ideas. In Mark 3:29, blaspheming the Holy Spirit is called unforgivable. Blasphemy has been condemned as a serious (sometimes, the most serious) sin by the major creeds and Church theologians. 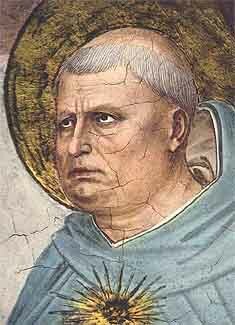 Thomas Aquinas stated that 'it is clear that blasphemy, which is a sin committed directly against God, is more grave than murder'. 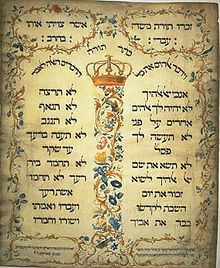 The Heidelberg Catechism stated that 'no sin is greater or provokes God's wrath more than the blaspheming of His Name'. The persecution of pagans, Jews, Muslims and dissident Christians began in the early middle ages. 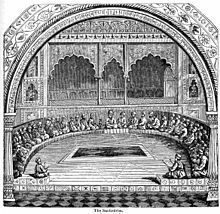 But it did not emerge on a large-scale until the creation, in the first part of the thirteenth century, of the Inquisition, an organisation set up by the Pope and handed over in 1232 to the Dominican order, who soon became known as ‘Domini canes‘ or ‘the hounds of the Lord‘. The Inquisition became a travelling ecclesiastical court which warned towns of its impending visits and encouraged individual Catholics to denounce all ‘heretical’ Christians or unbelievers. Parents were encouraged to betray their children and children their parents; anonymous denunciations were received with enthusiasm. 'Heretics’ were arrested and their guilt was assumed. If the victim confessed to holding heretical views then he or she was spared much suffering but when the victim made no confession he was tortured. While the victim endured the pain, the rack or other instrument would be sprinkled with holy water. Overwhelmed by pain and out of his mind with anguish, after a few hours of this torment, the victim would usually give all the information that the Inquisitors wanted to hear. But it was the Protestants the groups which had rebelled against the authority of the orthodox church and its inquisition who tended to make new constitutions and new laws in the moulds which had been cast by their persecutors. Instead of transcending the Inquisition they reproduced some of its most repressive features. A times, it was the 'blasphemers' themselves who chased down and eliminated any who opposed their own (new) ideas about God and religion. 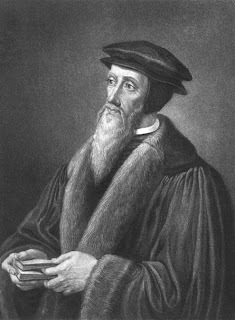 John Calvin (1509 – 1564) was an influential French theologian during the Protestant Reformation (in effect, a heretical and blasphemous protest against the established Roman Catholic Church). Calvin broke from the Roman Catholic Church around 1530 and, after religious tensions provoked a violent uprising against Protestants in France, Calvin fled to Basel, Switzerland. Calvin found it intolerable ‘when a person is accused of blasphemy, to lay the blame on the ebullition of passion, as if God were to endure the penalty whenever we are provoked’ (meaning, a person has no right to swear or curse). In Geneva, Calvin, after some initial signs of leniency, harshly opposed both blasphemy and heresy as soon as he had the power, calling heretics and blasphemers ‘traitors to God’. Calvin was directly responsible for at least one blasphemer’s death. 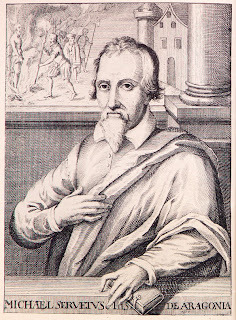 Another theologian named Michael Servetus opposed the doctrine of the Trinity (as had Calvin) but he had compounded this crime by openly opposing Calvin as well. Calvin turned around and denounced Servetus to the Catholic Inquisition but with no effective response, Calvin had Servetus arrested and tried for heresy and blasphemy then sentenced to death. Calvin opposed death by burning as being too cruel (perhaps also, too orthodox) and endorsed Servetus’s request that he should be beheaded. But the court over-ruled Calvin and Servetus was burned the next day using green wood which burned slowly. After half and hour he passed out and died. Servetus' last words were 'O Jesus, Son of the Eternal God, have pity on me'. This was taken to be proof of his guilt by Calvin and his followers since Servetus had not referred to the 'Eternal Son of God'. In the Catholic Church, there are specific prayers and devotions as Acts of Reparation for blasphemy such as the prayer entitled The Golden Arrow Holy Face Devotion introduced in 1844 and a number of others included in the Raccolta Catholic prayer-book. Early Christianity itself was the victim of blasphemy. The Alexamenos graffito ( also called the graffito blasfemo) is an inscription carved in plaster on a wall near the Palatine Hill, Rome. It is thought to be one of the earliest known pictorial representations of the crucifixion of Christ. 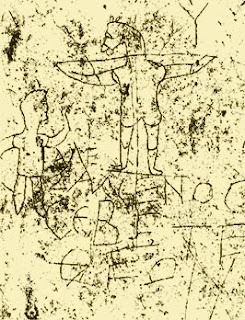 The image depicts a human-like figure with the head of a donkey, fixed to a cross. In the top right of the image is a tau cross (see post: Execution by Crucifixion) and on the lft of the image is a young man, apparently intended to represent Alexamenos, a Roman soldier/guard, raising one hand in a gesture suggesting worship. 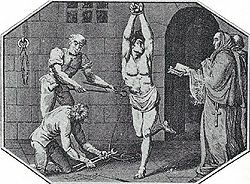 In medieval times, under canon law, the Catholic Church meted out punishment for blasphemers by fining and flogging them, piercing their tongues and making them galley slaves. In England, the courts justified blasphemy laws on the grounds that Christianity was parcel of the laws of England (the ‘state religion’) and therefore to reproach the Christian religion was to subvert the law. 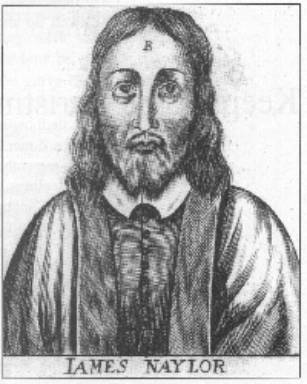 Under English common law, in 1656, Yorkshire Quaker James Naylor was convicted of blasphemy then flogged and imprisoned, his tongue pierced with a red-hot poker and his forehead branded with the letter B. 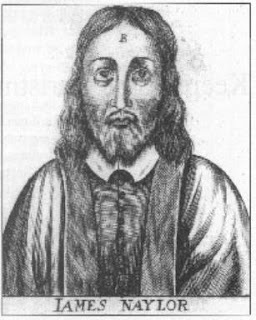 In England in 1676, an apparently deranged man, who claimed that Jesus Christ was whore-master and that religion was a cheat was taken to trial. During the trial, the Lord Chief Justice, Sir Mathew Hale, articulated clearly the principle which had always been implicit in the English concept of blasphemous libel: that Christianity was part of the law of England and that a threat to the Church was, by its very nature, a threat to the state. He said : 'That such kind of wicked and blasphemous words were not only an offence against God and religion but a crime against the laws, States and Government'. This judgement expressed an attitude towards blasphemy which would be found throughout seventeenth century Europe, especially in Protestant countries. The laws against blasphemy were not simply restraints on religious freedom but made up an important part of of legislation whose major instrument of suppression was the law against sedition. This in effect transferred the aura of sacredness and holy dread, developed around Christianity to the laws of the state and the government which upheld them. Speaking critically or disrespectfully about the government or its officers was construed as a kind of political blasphemy and was punished just as severely as its religious counterpart. In Britain, 20-year-old Thomas Aikenhead was executed for the crime of blasphemy in 1697, the last execution in Britain for this ‘misdemeanour’. Aikenhead had denied the veracity of the Old Testament and the legitimacy of Christ’s miracles. In 1885, the burning of a Bible led to the last blasphemy prosecution in Ireland before the founding of the Free State. Prosecutions for blasphemy in Ireland effectively ceased when the Church of Ireland was disestablished in 1869. In 1917, a legal case in Britain of Bowman v Secular Society Ltd alleged that a bequest to the Secular Society Ltd was invalid, as the object of the company involved the denial of Christianity. The House of Lords decided that this object was not unlawful. In 1921, a man from Bradford, John Gott was the last person in Britain to be sent to prison for blasphemy when he published pamphlets satirising the Bible. In his publication, Gott compared Jesus to a circus clown. Gott was sentenced to nine months hard labour and of poor health, died shortly after his release. Saying no to the gods, with time, became more ‘acceptable’ or, at least, more tolerated. But there was (and still is) the fear among many, that disagreeing with those in power – whether they be politicians or religious figures (or both) – exposes you, perhaps even targets you for the day that dissenters may have to be purged. * The History of Blasphemy: subject of research for the novel The Tao of the Thirteenth God – Amazon Kindle.